If you’re serious about your video productions, you probably shoot in 4K, and so you also want (and need) 4K stock footage as well. But where to buy 4K stock footage cheap? You must know being virtually the highest resolution available at most stock footage outlets, 4K videos normally have the highest price points too. But this doesn’t mean they’re expensive or unaffordable! In fact, we have some great deals in 4K stock videos that you’re going to LOVE. Ready to discover them? Read on! At risk of stating the obvious, you should definitely work with 4K video clips because it’s the highest definition available to the masses. And what we all want more than anything is the sharpest, most realistic image possible. Even if you will not be exporting your final file in 4K, it makes a lot of sense to get 4K footage –that usually comes in RAW format with greater editing flexibility–, since you can easily downgrade the resolution as needed (for a YouTube video or a social media video for example). The opposite –upgrading image quality– is sometimes possible but it’s a lot harder to do. As long as you can afford it, it’s always best to buy 4K stock footage: you’ll have the content in the highest resolution possible, so you can repurpose it as many times as you want without too much hassle. Here you can find more details on image resolution, file formats and more about 4K footage. So where to buy cheap stock footage in 4K? 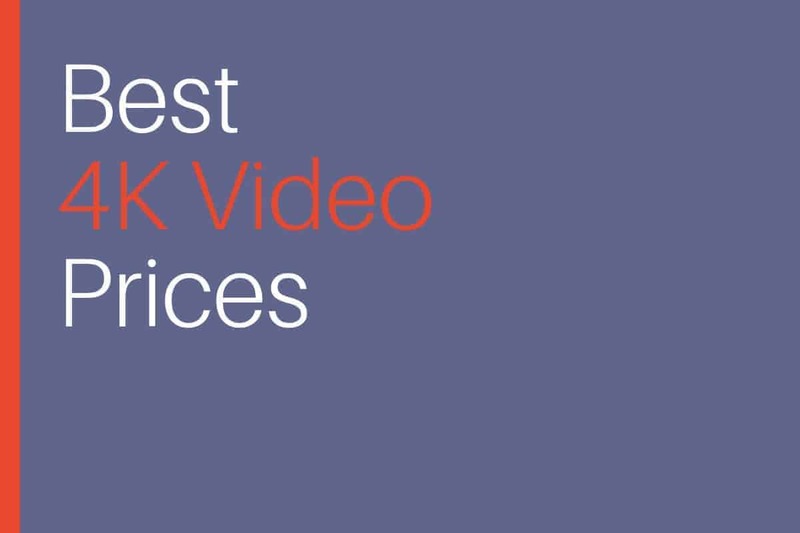 Below is our list of the best and cheapest offers in 4K Stock Videos. Dive in! iStock is one pioneer company in stock media, and a very successful one as well. Backed by prestigious Getty Images and famous for their thoughtful curation process, their stock footage offer is distinctive for their large collection of exclusive, high-valued content, added to a selection of budget friendly videos. You can learn it all in our iStock Video review. iStock prices videos based on collection, not in image resolution. This means that 4K costs the same as HD, making them one of the cheapest deals in 4K stock footage in the market! The final cost of each video will vary. There’s a fixed price per unit for quick checkout, but you can also buy credit packs, where the individual credit price lowers in bulk purchases, letting you save in the long run. What’s cool is that iStock credits never expire, so you can invest now and download videos whenever you want. That’s right: at iStock you can buy professional, carefully curated 4K videos for as little as $48 each! Even more, you can get first class, exclusive 4K footage for only $144 the piece! This is a real bargain if you compare it to the standard price for 4K clips across the market, which is around $199 per download. So if you’re after 4K stock footage, iStock is definitely your best friend. Especially now, because our exclusive iStock Promo Code gives you a great 15% Off in EVERYTHING including CREDITS! For a limited time, you'll be able to buy credit packs and subscriptions at a cut price! Grab the code now! Videoblocks by Storyblocks is a company specialised in stock footage with a very distinctive offer that brings the “Netflix model” to stock. They have a large, wholly-owned library full of clips in all resolutions, covering various topics and styles. Plus they include a huge crowdsourced marketplace with millions of videos, all ready to download and use. You can find more info in our Videoblocks by Storyblocks review. Videoblocks offers subscriptions for video, and they have unlimited download plans. These plans give access to their native library with hundreds of thousands of videos including 4K content, at no added price. This means you can download as many 4K videos as you want, for one fixed fee! If you have a need 4K videos all the time, this is a great solution. Just with a Basic plan you're getting them at only $1,65 each (with annual plan). That's insane! You can even hire it for just one month and it's still a great deal. If you need more than 5, the unlimited plans make perfect sense. Think of the lowest per-clip prices out there and it's clear that after a few downloads you're already saving hundreds of dollars! This is still a very reasonable price for the highest resolution videos around. So if you have a constant need for 4K stock footage, Videoblocks has you covered. Their unlimited plans make you save more the more clips you download, and the added marketplace ensures you'll always find the content you're looking for, at cut price. Ready for the good news? Videoblocks has a free one-week trial offer that lets you download up to 35 clips from their library (including 4K!) at no cost at all. So go ahead and start you Videoblocks Free Trial right now! Download Anything from $10M of Content with this 7-Day Free Trial. Shutterstock is a hugely popular stock media agency, owner of one of the industry's largest stock footage libraries, with over 10 million video clips ready to download and use. They're known for their strict technical standards, the infinite variety in content, and very low prices. Their offer includes videos from web size to 4K, all available on demand. For more info, check our Shutterstock review. They sell video packs according to resolution, which let you save more as you buy more, and they have the largest variety in 4K footage around, granting you'll always find the right clip for your work! Like this, you can decide how much you want to spend, thus how much you will be saving. You can obtain 4K stock videos for as low as $159,16 if you're willing to invest upfront. Plus, video packs are valid for a whole year after the purchase date, giving you great flexibility when it comes to planning your downloads. The added value in this offer is the huge pool of content you access: with over 10 million clips to choose from, you'll find options for every topic you can imagine! So if you love to have options when it comes to 4K content, and like to control how much you spend and when, Shutterstock is certainly an alternative worth exploring. Even more so now, because using our special Shutterstock Coupon Code you will be saving 15% in your purchase of 4K video packs! So which one will you choose? Let us know!